The most efficient Hard Disk cleaner! As a proof of its efficiency, it often finds up to many Gb not even seen by its competitors so… give KCleaner a try ! And if data security is something you are interested in, you’ll love the secured file deletion methods proposed by KCleaner, making deleted files unrecoverable by any known mean. KCleaner Pro is a solid reliable cleaner so I do recommend – However I prefer the wider range of options offered with CCleaner. Hard drive space on computer shrinks over time, and gets filled by the junk that our system produces. The junk keeps filling up hard drive space until there’s no space left for our documents, music, pictures, movies etc. Cleaning this junk is not an easy task, and most cleaning software applications do not work as they claim to. KCleaner PRO is a powerful software application, designed to remove useless and unused files from the computer. With this cleaner, you can remove temporary files, Recycle Bin items, cookies, Browser cache(Firefox,Opera,Chrome), Windows log files, Windows Error Reports, and many other useless items. The installer size is only ~1MB and the installation process is simple and does not take much time at all. Upon launching, you can straightaway start cleaning junk from your hard drives, by pressing the clean button. It scans your hard drives and automatically cleans the junk files. If you want to be able to choose what to delete and what not to, you can switch to ‘Expert Mode’ to get complete control over the cleaning process. The UI is plain and simple, and contains about 8-10 rectangular buttons with colored icons. The UI is designed to be suitable for both the novices and the expert users. There are two modes of the UI, ‘Basic Mode’ and ‘Expert Mode’. By default, the application opens with the ‘Basic Mode’, which contains only a few buttons, is very easy to work with, and it automatically deletes useless files at a click of a button. The ‘Expert Mode’ comes with all the features in the ‘Basic Mode’, with an added ability to choose what to keep or delete. You can easily turn on the automatic cleaning, and make the application scan and delete useless files at a certain time interval. The automatic cleaning serves great purpose for the novices and busy users, once set-up they can let the tool run in the background and not worry about the trouble caused by useless and unused files. The application comes with the possibility of choosing what to do after the cleaning has finished. You have three options to choose from, namely ‘Clean & Shutdown’, ‘Clean & Reboot’, and ‘Clean & Close’. This can be very useful in case you do not want to spend your time in front of the computer waiting for the deletion process to end so you can turn off the PC. In the settings menu, there is a huge list of file types, and you can choose what to scan for in the cleaning process and what not to. The list contains temporary items, recent files, cookies, temporary Internet data, hotfixes and service pack uninstallers, Windows log files, Recycle Bin items, Windows error reports, Windows thumbnails, and many more. There are a few options provided by this application to ensure that the sensitive data you deletecan no longer be recovered by any recovery utilities. It provides options like scramble filenames and trim items before deletion. Moreover, there are 3 deletion methods to choose from, namely Standard, 1 Pass Random, and DoD 5220.22-M (3 passes). The application performs the cleaning process efficiently and with precision, but it lacks some important features that other cleaners offer. Firstly, it does not offer any back up option for recovery and necessary system files before the deletion process. Other features that I think should be included are option to uninstall programs, manage startup items, and identify duplicate items. 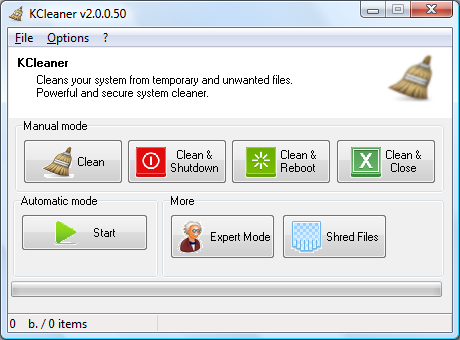 KCleaner PRO is an intuitive and reliable tool, that can help you free up your hard drive from the junk files. Automatic cleaning it offers works great, and the secure deletion methods are a useful features to ensure your safety. It does not use a lot of system resources and works smoothly over all. Inclusion of a few more features would really make this tool a great choice. I am very careful about “cleaning” stuff from my PC and was dubious that this software could find much on my PC to delete. To my surprise it found a few hundred MB of unnecessary files, and also was very fast. It’s a good program wich consume few resources.I like because it is small and it’s moving fast.Even if it is small, it have a lot of functions.